I am a HUGE advocate for quality Baltic Amber Teething Necklaces like the ones from Baltic Essentials. 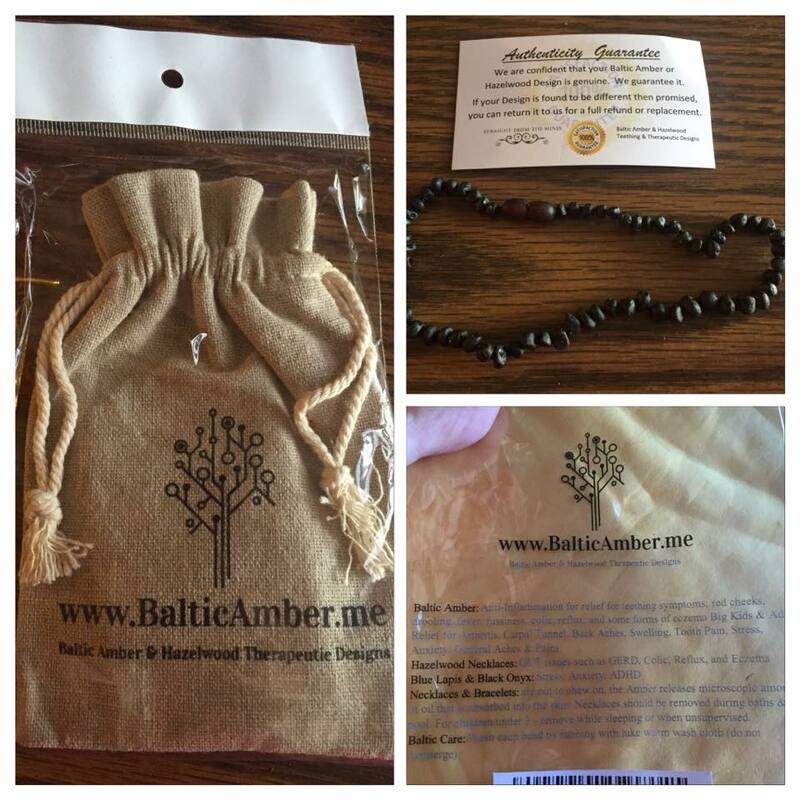 There are many different types out there and you have to get a necklace made of genuine Baltic amber. I let my little man wear his daily. In fact, we never take it off. He takes a bath in it, sleeps in it, and I never know he is even teething anymore. I say anymore because before I received a quality necklace that was made of genuine Baltic amber, my son was clinging and cry which was not in his nature only when he was teething. Now, I didn't even realize his eye teeth were coming in which according to his pediatrician and dentist are usually the worst. 1. They wear it. They don't chew on it. The necklace needs to be short enough so it can't slip up over their head at all. 2. The succinic acid absorbs into the skin because of the body heat. That is what helps with teething. You can even use a teething necklace on your older children when they are about six years old and their permanent molars come through. One lucky Nanny to Mommy reader will win a Baltic Essentials Cherry Teething Necklace! Retail value $50, but currently on sale of $19! This giveaway is open to US only, must be 18+ to enter. Winner chosen via Random.org through Rafflecopter. All winning entries are verified. Good luck! Make sure to follow us on Facebook to stay up to date with all of our current giveaways. Disclosure: Karen’s Got Mail, Housewife on a Mission and the Thankful & Stuffed - A Thanksgiving Giveaway Hop participating bloggers are not responsible for sponsors who do not fulfill their prize obligations. Facebook, Twitter, Pinterest and any other social media are not affiliated with this giveaway. I love that they help soothe babies! I would keep this for my own teething daughter and then pass it on to my nephew when he starts to get teeth. I love that they are a natural teething soother!! I also love that they are so super cute!! I would give it to my little one. I love how baltic amber necklaces are a natural alternative! I love that it has a function for baby without looking like it! I have been looking into a teething necklace for my new little one coming in april. my 4th baby was a horrible teether, and I am not so sure I could handle another like that nor would I want them to go through that if I could do anything about it. So, I would def keep it! I like that they are stylish and functional. I would give this to my friend who is expecting. I love that they naturally help with teething pain and even help with drooling! I would give this to my 7 month old who is teething. I would be giving this to a friends who has a baby teething. I love this idea. I would give this to my son and daughter in law who have an 8 month old. I would give this to our middle girl. She has headaches a lot and after seeing what amber has done for our 2 year-old, I am a firm believer! I think it is very soothing for a baby cutting teeth to have a teething necklace. I would give this to my son's new baby girl.